1. 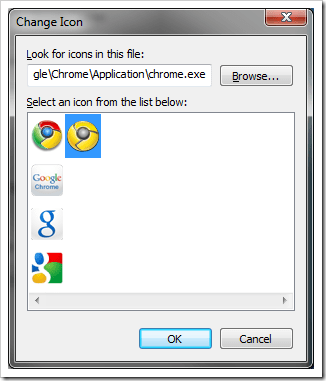 Right-click on an icon you would like to change, say Google Chrome, and right-click on the same program name from the jumplist, and choose Properties. 2. 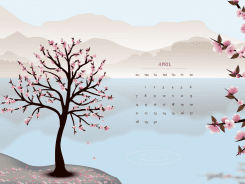 Click on the Change Icon… button. 3. Pick up a new icon showing in the list, let’s say the yellow Chrome. 4. Click OK twice to get out of the properties window. 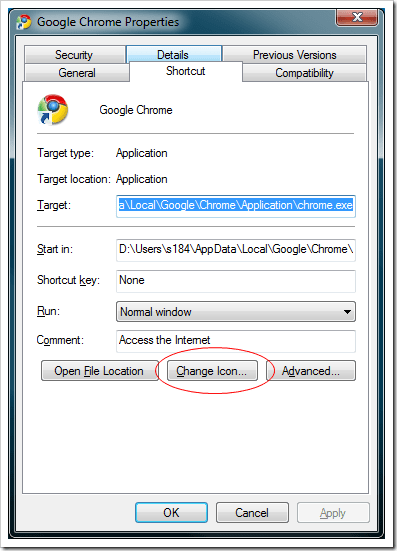 Now you have successfully changed the icon for taskbar pinned Google Chrome but you won’t be able to see the change right away. You can either wait for the next cycle of IconCache rebuild which I don’t know how often it takes place, or you can follow the steps below to refresh the IconCache manually. 2. 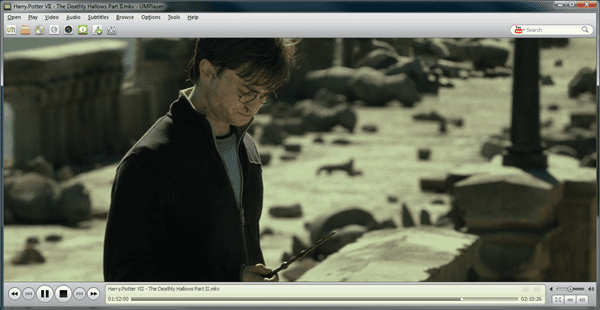 Delete or remove the file IconCache.db file, which will be rebuilt from the next boot. 4. Now let’s see what the new icon looks like from the taskbar. 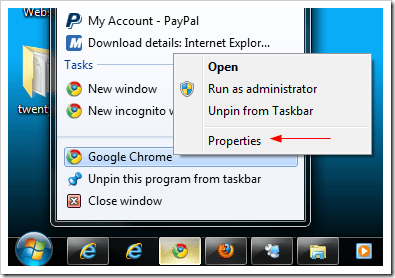 The change you made through this process is only valid as long as it’s pinned on the taskbar. If you unpin it and re-pin the program back you will need to re-do the process again to make the change. 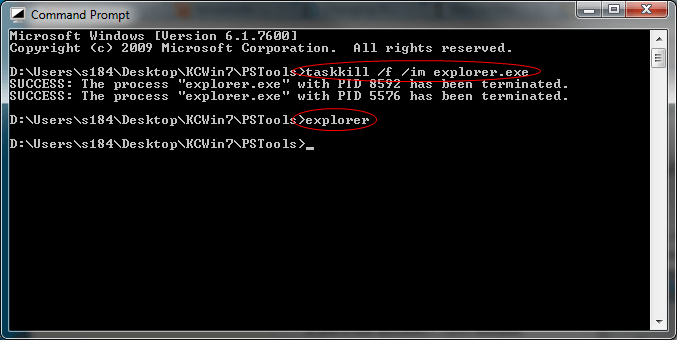 So think twice when you unpin any program from the taskbar. You can change the icon, but it’s a bit of a hassle and a bit technical. Apparently in the pre-release version of IE9 it was simple, but they removed that functionality for reasons I’ve not been able to discover. 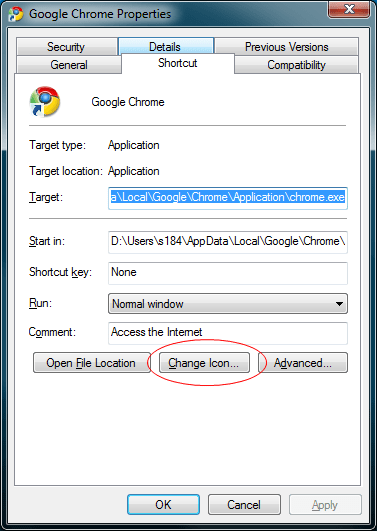 Find the shortcut you want to change the icon on, and change it’s filename extension from “.website” to “.url” Note that the “.website” extension will not show up in Windows Explorer, so you’ll have to use a CMD box or other method to change it. When it’s renamed, you can right-click the shortcut and change it’s icon. 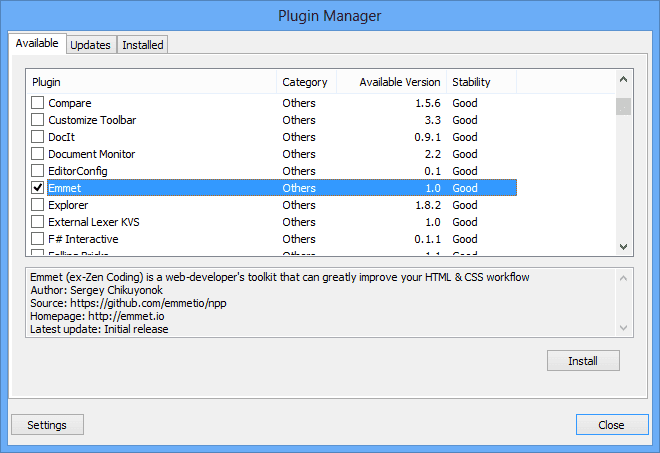 When you’re done, you’ll need to change the filename extension back. Alternately, you can open the shortcut (without changing the extension) in Notepad or other text editor and change the IconFile and/or IconIndex lines manually. Whichever way you do it, the new icon will not appear on the Taskbar until the icons are refreshed, or the icon is unpinned & repinned. 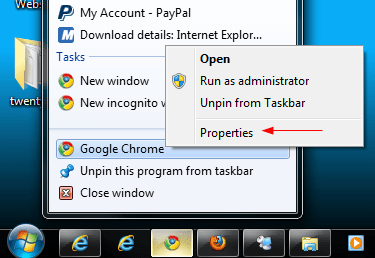 I find the easiest way is to right-click and UNPIN then right-click and PIN while in the Taskbar folder mentioned above. Hope this helps someone. Hope even more that M$ fixes this screw-up. The easiest and safest way to force the Iconcache to rebuild that I’ve found is from the Windows desktop right-click menu “Personalize>Change Desktop Icons”. 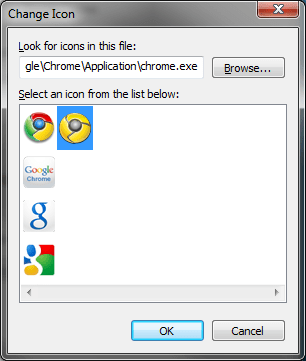 From there change a standard icon (like Recycle Bin (empty)) to another icon and “Apply”. So I restarted the explorer anyway and it worked perfectly.